Imagine what it would be like to watch how the individual atoms of molecules rearrange during a chemical reaction to form a new substance, or to see the compounds of DNA move, rearrange and replicate. Such capability would give unprecedented insight to understand and potentially control the processes. The simple idea of watching how molecules break, or transform, during chemical reactions has, until now, been unfathomable since it requires tracking all of the atoms, which constitute a molecule, with sub-atomic spatial and few-femtosecond temporal resolution. Hence, taking such "snapshots" with a combined spatio-temporal resolution to witness a molecular reaction was considered fodder for science fiction. Exactly 20 years ago, one of the ideas proposed considered using the molecule's own electrons to image its structure: Teach the molecule to take a selfie! The idea was brilliant but impossible to implement – until today. In their recent study, reported in Science, ICFO researchers from the Attoscience and Ultrafast Optics Group in collaboration with researchers from the USA, the Netherlands, Denmark and Germany, have reported on the imaging of molecular bond breakup in acetylene (C2H2) nine femtoseconds (1 femtosecond = 1 millionth of a billionth of a second) after its ionization. The team was able to track the individual atoms of the isolated acetylene molecule with a spatial resolution as small as 0.05 Ångström – less than the width of an individual atom – and with a temporal resolution of 0.6 femtoseconds. What's more, they were able to trigger the breakup of only one of the bonds of the molecule and see how one proton leaves the molecule. "Our method has finally achieved the required space and time resolution to take snapshots of molecular dynamics without missing any of its events, and we are eager to try it out on other molecular systems such as chemical catalysts and bio-relevant systems" said Jens Biegert, ICREA professor at ICFO and leader of the research. Benjamin Wolter explained, "the flight path and kinetic energy of all collision fragments were recorded with the reaction microscope similar to a big particle physics experiment." 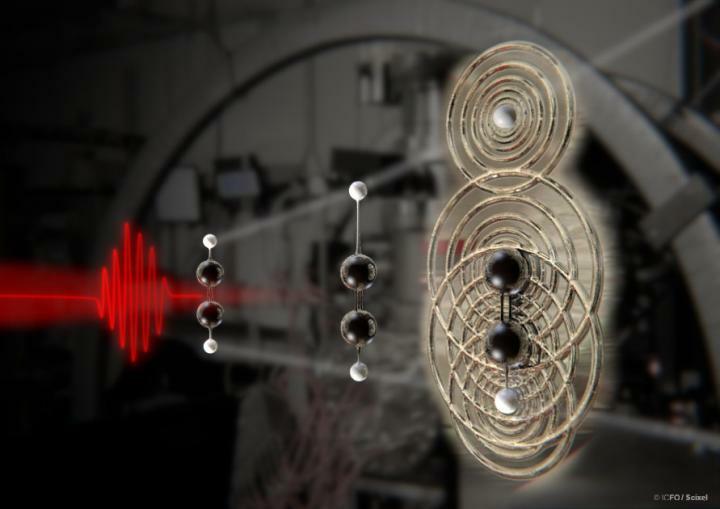 "We took one electron, steered it along a specific path with the laser and scattered it off an isolated molecule to record its diffraction pattern" said Biegert, "it is mind-boggling to imagine the length and time scales of the experiment. The fantastic cooperation between experimentalists and theorists, atomic physicists and quantum chemists from ICFO, Kansas State University, Max-Planck-Institut für Kernphysik, Physikalisch Technische Bundesanstalt, Center for Free Electron Laser Science/DESY/CUI, Aarhus University, Friedrich-Schiller University Jena, Leiden University, and Universität Kassel made it possible to achieve such feat". ICFO – The Institute of Photonic Sciences, member of The Barcelona Institute of Science and Technology, is a research center located in a specially designed, 14.000 m2-building situated in the Mediterranean Technology Park in the metropolitan area of Barcelona. It currently hosts 400 people, including research group leaders, post-doctoral researchers, PhD students, research engineers, and staff. ICFOnians are organized in 23 research groups working in 60 state-of-the-art research laboratories, equipped with the latest experimental facilities and supported by a range of cutting-edge facilities for nanofabrication, characterization, imaging and engineering. The Severo Ochoa distinction awarded by the Ministry of Science and Innovation, as well as 13 ICREA Professorships, 21 European Research Council grants and 6 Fundació Cellex Barcelona Nest Fellowships, demonstrate the centre's dedication to research excellence, as does the institute's consistent appearance in top worldwide positions in international rankings. From an industrial standpoint, ICFO participates actively in the European Technological Platform Photonics21 and is also very proactive in fostering entrepreneurial activities and spin-off creation. The center participates in incubator activities and seeks to attract venture capital investment. ICFO hosts an active Corporate Liaison Program that aims at creating collaborations and links between industry and ICFO researchers. To date, ICFO has created 5 successful start-up companies.